Here are a few pictures from St. Peter’s and the Vatican Museum, especially the Raphael Rooms, on our trip to Rome in February. St. Luke very high up in the central cupola — taxing my pont-n-shoot’s capabilities. 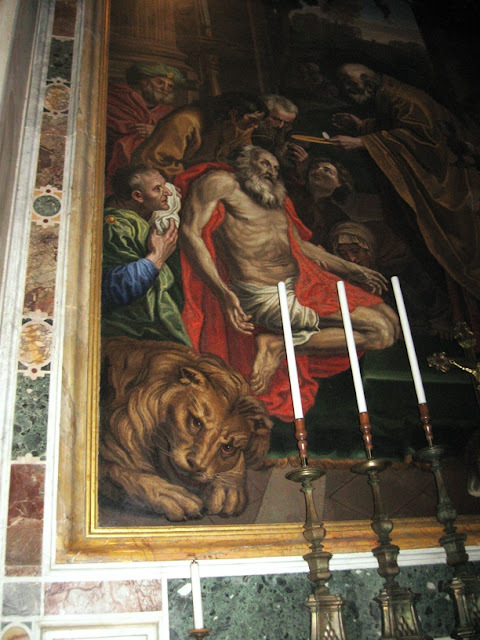 Like most of the “paintings” in St. Peter’s, this, St. Jerome’s Last Communion, is a mosiac. There are several attractive floor vents, well polished by the shoes of the faithful. This was about 1.2 m wide. Two happy tourists begin their tour. The Hall of Maps — a very long corridor with maps of different regions of hte world on the walls between the windows. No doubt Popes paced this walk and studied the maps with very secular concerns. 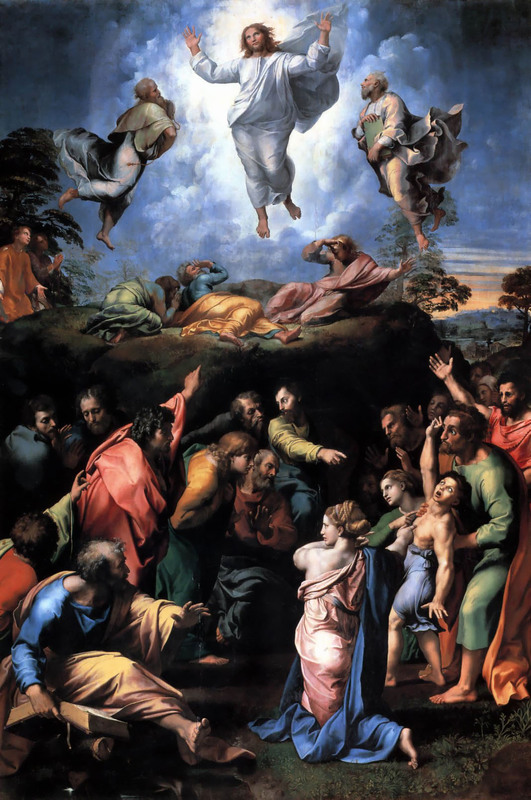 Raphael’s gorgeous transfiguration had an uncrowded room all to itself. Here are some images from one of Raphael’s four rooms (this one is Stanza della Segnatura). Two views of the ceiling–together covering the whole. The School of Athens is a Who’s Who of Greek leaning. Below are Plato and Aristole (top left), Diogenes (reclining on the steps) and Archimedes or Euclid (bottom right drawing with a compass). The man with dark hair in the bottom right is thought to be Rapahel himself. In the centre foreground is Michelangelo, easily recognised from his trademark boots. The seated figure with abook is Pythagoras. On the left edge is Epicurus holding a plate.